Combine the almond flour and powdered sugar in a large bowl. Using a sifter, sift mixture 3-4 times, until thoroughly combined. Separate egg whites from yolks and allow to sit at room temperature for 2 hours and up to 24 hours. In the bowl of a stand mixer using the whisk attachment, beat the egg whites on high speed until they begin to froth. Add the cream of tartar and continue to beat until the egg whites begin thicken and resemble shaving cream. Add the granulated sugar and continue to beat until stiff peaks form when you lift the whisk attachment from the bowl. Add the sifted almond flour and powdered sugar to the egg whites in three additions, mixing by hand using a rubber spatula or wooden spoon after each addition until combined. The batter will be thick at first but as it comes together it will loosen up. I use a folding motion and mix until the batter falls off the spatula in a blob but isn't runny. It might take making macarons a time or two to get the feel for it, but you want to try not to undermix or overmix. Prepare a pastry bag or large ziploc bag with the tip snipped off with a round tip. Add a few stripes of red gel food coloring up the insides of the bag before filling with macaron batter if you want the red and white swirl effect on your finished macarons. Pipe into 1-inch circles on parchment lined baking sheets using a swirl motion. Rap each pan against the counter 2-3 times to remove bubbles, then let the macarons sit uncovered at room temperature for 30-45 minutes. Heat oven to 300 degrees, then bake macarons for 15-18 minutes. Cool completely before removing from the parchment paper. Beat the butter in a mixer until pale, smooth and creamy, 2-3 minutes. Add powdered sugar 1/2 cup at a time, mixing well between additions. Add peppermint and vanilla, then add cream or milk, 1 tablespoon at a time, until you reach a spreadable, but still thick, consistency. Pipe frosting onto the bottom of one macaron shell, then top with a second shell. 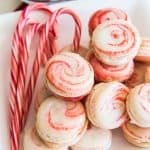 Roll edges of each filled macaron in crushed candy cane, if desired. Technically, you are supposed to wait to eat the macarons until the next day because they taste even better then, but they are super hard to resist! Recipe adapted from Cook with Manali.